1. Warm the vinegar in a small pan with the palm sugar over a medium heat for 3-5 minutes, or until the sugar has dissolved. Pour into a small bowl, then add the chilli, garlic, lime juice and fish sauce. 2. Bring a large pan of water to the boil over a high heat. Add the beans, return to the boil and cook for 6 minutes until tender. Drain (saving the water – see below) and then cool the beans under cold running water. 3. Place the edamame beans in a heatproof bowl, pour over the reserved cooking water from the beans or enough boiling water to cover. Leave for 1 minute, then drain and rinse under cold water. Tip both the green and edamame beans onto kitchen paper and pat gently to dry. 4. 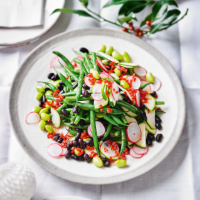 Mix the courgette, radish and black beans together in a large bowl with the green and edamame beans. Toss with the chilli dressing before serving.